Get all the inside information on the Snow Bike Festival in Gstaad, Switzerland and start planning your visit for 2018's event! Ryan has been before and will be going back for the snow bike riding, fondue eating and incredible alpine landscapes. The first snowfalls of the season have begun dusting the high ground in the Northern Hemisphere - it’s true because Instagram says so, and already my thoughts are floating in one direction - to Gstaad for the 2018 SnowBikeFestival. Skiing, snowboarding and all the well known snow sports will always be tantalizing, but the experience of riding through the snow is something extra special, and not as extreme as you probably think. I first road the SnowBikeFestival in 2016, and then again this year (2017). The first time I road I was super surprised at how quickly my nerves settled and I eased into quietly turning the pedals over and just enjoying riding next to a semi-iced over stream under a light snowfall and crisp Alpine air frosting in front of my face. This year was extra special as I took the time to stop and enjoy the small towns we rode through and really make the most of taking in the surroundings. Fat tyre bikes are really good for riding in the snow. Other than the oversized tyres, there is not too much difference to a normal mountain bike and with just a little familiarising myself with the effects of breaking and the crunch of snow under the wheels, I was good to go. Mostly the riding takes place on single tracks and catwalks, whether on a steep gradient climbing a mountain, or just cruising in a forest, or glorious open snowy fields. After some strenuous climbing, the rewards of speed and extra adrenalin come into play when taking on the red runs of Gstaad’s ski slopes. Here it’s just the back brakes and a controlled slide of the back wheel to guide the bike down the run and all the hard work of climbing becomes instantly gratifying. Gstaad is a fantastic Swiss town for experiencing the myriad of activities such a versatile place has to offer. The valley is spread over a much wider area than most other skiing towns of the Alps, which makes mountain biking so enjoyable and one of the reasons the event is held here every year. It’s only a handful of top riders who really gun it at full throttle, most competitors are here for the full social experience and chilled vibe of taking part at your own pace. Fondue in a cow shed, beers at some of the hotel bars, horse drawn carriage rides through the town and exploring the place at night under the fairytale lights are all part of the experience. Next to Gstaad is Saanen and my buddy Nick and I also went on an outdoor fondue adventure (the cheese eating does.not.stop in Switzerland) while taking in some downhill world cup skiing action and watching the slow motion air balloons above. It really becomes quite a surreal landscape once you get out to enjoy it from different angles. Snowboarding up on Glacier3000 was a special place to be too and the views on a clear day as spectacular as the buzz of a couple of beers at high altitude. Bikes are available to rent all year around, just ask Gstaad tourism, but I’m going back for the access to the mountain via the 4 days of SnowBikeFestival, and this time I’m taking my drone along to track me through some of the most glorious mountain biking tracks in the world. 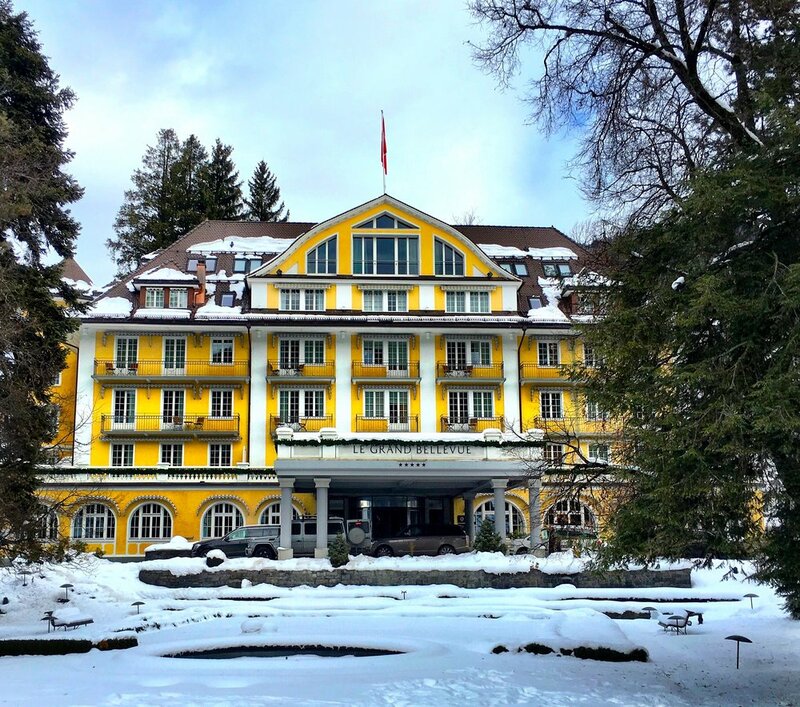 See you in Gstaad! I fly SWISS from Cape Town into Zurich and jump on the imperious SBB Swiss trains from there to Gstaad. The train trip is one of the highlights of the whole adventure. Expect absolutely faultless timing on the trains and grab a window seat for a continuous picture-postcard view of lakes, mountains, forests, towns and general Swiss beauty. Want to Contribute? Click Here. Copyright © 2018 The Travel Hub. All Rights Reserved.